Deliver SMS messages to thousands of people using our Internet SMS service. Our web-based SMS platform allows you to send and receive text messages online, helping your business carry out cost effective mobile marketing promotions and deliver notifications to customers. With a higher open rate than email marketing and lower costs than direct mail, SMS is one of the most popular marketing channels in use today. Our internet SMS gateway lets you deliver your company's message via our user friendly web interface or API. We work with a wide range of UK customers, from small businesses to large brands. Our bulk pricing means that the more text messages you need to deliver, the less you'll pay, with prices as low as 1.74p per text message for high-volume users. Why should you use an Internet SMS service? SMS is a fantastic communications channel, whether for marketing purposes or simply to keep in touch with your customers. Our internet text messaging platform lets you reach people with a message that's far more likely to be noticed and read than an email or direct mail letter. Data from Ofcom shows that more than 93% of UK adults use a mobile phone. Thanks to great mobile phone usage throughout the UK, sending an SMS to your customers or prospects is one of the most effective ways to ensure your message isn't lost in the clutter of day to day life. Our platform is designed for businesses of all sizes, from low-volume senders in need of a user friendly platform for delivering notifications and marketing messages to bulk SMS marketers in need of a cost effective, powerful Internet SMS solution. Do you need to use dynamic information in your text message campaign? Our platform makes it easy to send dynamic text messages that are personalised for recipients with specific user data such as the person's name, delivery number or other information. 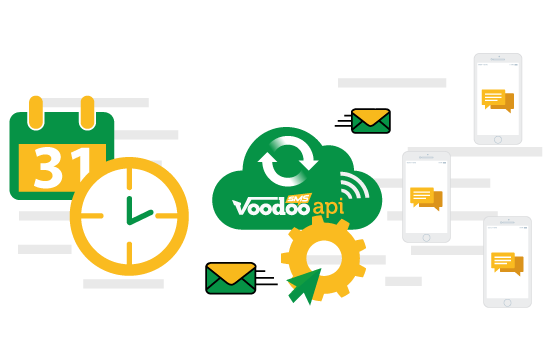 Our internet text messaging API also makes it easy to use Voodoo SMS to deliver notifications from your mobile or web app, from two-step verification codes to alerts, promotional offers and much more. Our platform is designed to make sending and receiving text messages easy. Create your free account and fund your campaign using our credits system. Our volume-based pricing lets you reduce your costs as you scale your SMS campaign, with pricing from just 1.74p per SMS. Sending your first Internet SMS campaign is simple. Import your marketing list and select your audience, then write your first text message. You can send your message straight away as an SMS broadcast or schedule it to deliver at a certain time and date for optimal results. Our SMS gateway allows you to send your messages from an identifiable sender ID, making it easy for recipients to recognise your communications. Receiving text messages using our online SMS platform is also simple. Create your own custom keyword for your business or campaign to use with our short code number or receive messages using your long phone number. Create your account and start connecting with your target audience using our online text service now. Our user friendly interface and fantastic volume pricing makes setting up your first internet SMS campaign a quick, simple and cost effective process.